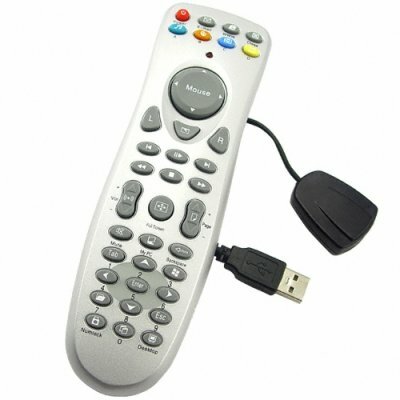 Successfully Added PC Remote Control - Media Function Remote to your Shopping Cart. Remote control and IR receiver for your PC. Media function remote for controlling common media features and windows functions of your home computer. Control windows media player, PowerDVD, RealPlayer, WinDVD, and similar software from the comfort of your recliner or couch. This PC remote is also useful as a wireless mouse and can be used for controlling Powerpoint and other presentation software. On top of all that, the CVSB-983 remote control can also be used to launch common windows functions including your default email and web browsing software. An easy to use computer accessory at an easy on the pocketbook price. PC media center remote control. Remote control for multimedia and navigation functions of PC. Great for wireless mouse functions. When I told my mate I paid under $15 for a remote for my PC multi media system, he thought it wouldn't be nearly as good as the one he paid $100 for here in Australia for his PC. Well he was over last night watching some movies and I gave him control of the new Chinavision remote. He was surprised that it not only great, but better than his. We didn't end up watchin all the movie, he was too busy going on to the Chinavision website. Thanks guys for price and quality. I wont be shopping at a retail store here in Aussie for these sort of items again. Fast Delivery from warehouse to my front door. Keep up the good work. on 2009-06-21 17:08:52 Super remote. The Super remote control for PC. You will Not find best. Works in all operating system which support the mouse and keyboard. Not it is necessary to install the drivers since recognizes as usual USB mouse and keyboard. Full management cursor mouse. Very suitable board.